A hernia is a rupture that occurs when an organ, intestine or fatty tissue squeezes through a weak spot or a hole in the surrounding muscle or connective tissue. There are different types of hernias in dogs, some more serious than others. Hernias can be caused by muscular strain or injury and are sometimes genetic. All types of hernias should be looked at and treated by a vet. If the umbilical hernia (at the umbilical cord site) can be pushed back in, it is called a reducible hernia and will need to be repaired. If it is not reducible it means the hole has closed or is too small for the outside tissue to be pushed back in. Reducible means you can push it in and make it temporarily go away, but it comes back. Some umbilical hernias need to be repaired and some do not. All hernias should be looked at by a vet to decide the proper course of action. Most umbilical hernias are repaired at the time of spay or neuter. Some dogs with umbilical hernias can still be part of a breeding program, as the hernias are not always genetic. During the whelp, sometimes a dam can be a little rough when it comes to cord care, pulling at the cord, causing damage to the tummy. Hernias that are genetic are called congenital umbilical hernias; these are when the puppy is born with a weak spot or hole in the belly wall. The intestine, fat or fluid pushes through the weak spot causing a bulge near the belly button (navel). "Puppy with an inguinal hernia—you can push the bubble back in, but if course it doesn't stay for long." When puppies are born with an inguinal hernia it is often a genetic birth defect. An inguinal hernia is a hole in the intestinal muscle wall where the intestines bulge out. If you do not get it repaired it could cause major life-threatening complications. 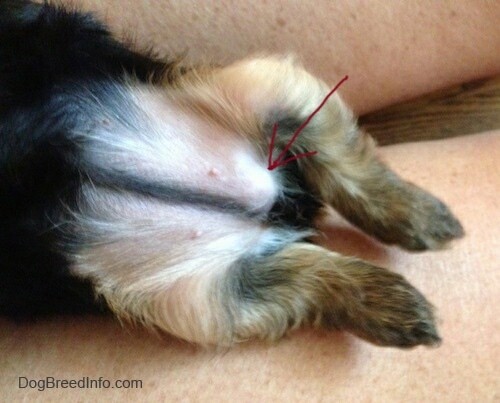 Puppies born with this type of hernia should be spayed or neutered at the same time as the repair so the defect is not passed onto other dogs. This type of hernia is a more urgent case than an umbilical hernia as inguinal hernias can strangulate the bowel.